One thing you will notice about anglers who have spent a lot of time on the water, and I mean a potentially unhealthy amount of time on the water, is they catch fish. This can be frustrating to new anglers who are just learning to steelhead fish and spend many fishless days casting. There is no substitute for time on the water, but understanding the biology of steelhead can certainly make us better anglers. There are two basic biological principles underpinning all of the mumbo jumbo steelheaders spew about catching fish in various weather and river conditions. Vision: If a steelhead cannot see your fly or lure it is not likely to bite it, despite having a variety of finely tuned senses, steelhead are primarily visual predators. Visibility can be obscured by a number of things but the most common is turbidity resulting from high stream flows caused by snowmelt or rain. High flows mobilize sediment, which turns rivers various shades of gray and brown. In general, 2-3’ of visibility is considered adequate for steelheading, but many of us have caught fish with less visibility, probably because we managed to get the fly/lure right in front of it. This highlights that during periods of poor visibility it is most important to maintain the offering in “the fish zone” for as long as possible, which means slowing down the presentation and being methodical. As visibility improves fish will move much further to strike a fly or lure and it is less critical to hit them in the face. 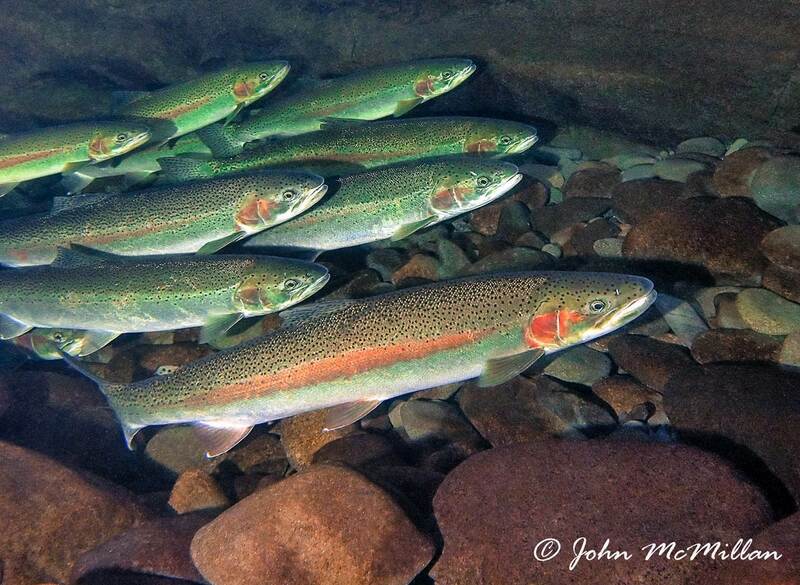 Metabolism: Steelhead are ectotherms and as such their body temperature is regulated by their watery environment. In cold water a steelhead’s metabolism is slower and therefore it will not move as far to grab and will generally strike in a less aggressive manner. The same is true when water temperatures become too warm and the fish become lethargic. Traditional wisdom tells us that low and clear conditions make steelhead fishing tough, but in reality it may not be the stream flows as much as it is the water temperatures. For instance, streams tend to get low in winter when it is cold and low in summer when it is warm. In either case the water temperatures are at their lower or upper extremes, meaning that fish are also at their metabolic extremes and consequently, are less responsive to an angler’s offerings. A fine example of this is during late summer and early fall when stream flows are low but temperatures often fall within the wheel-house of maximum activity for steelhead (50-65°F) and they are highly aggressive. Basically this means that we can’t consider stream flows without considering water temperature because it is the latter that is truly driving the metabolism of steelhead. 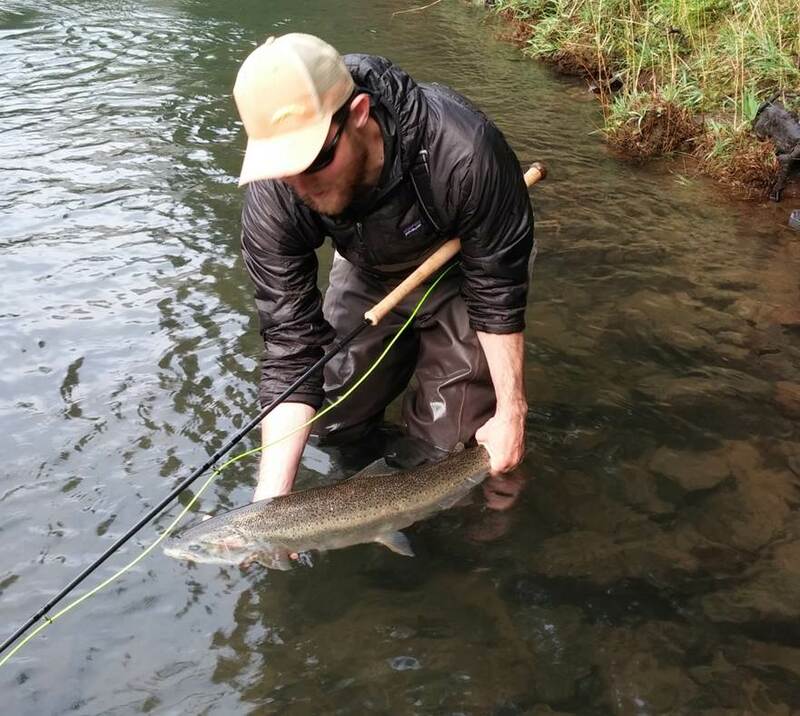 There are several other factors, often correlated with the visibility and water temperature, that also influence the aggressiveness of steelhead. Each of those factors may provide an angler with a bit more information about how and when to fish for steelhead. The first is weather. Many anglers have a ritual of checking all of their weather, surf forecast and stream flow websites prior to their trip. While all that information will tell an angler how to dress for their upcoming trip, weather is a secondary factor and the effects of variable weather is underpinned by visibility and temperature. For instance, winter storms are generally warm and full of moisture, which tends to increase water temperatures. This warming trend will increase a fish’s metabolic rate and fishing can be at its best if the warming temperatures are coupled with a reduction in visibility to the point where fish feel safe but can also easily see the fly or lure. Think about the old adage, “three feet of vis and dropping and clearing”. We can assume that a storm has brought in warm rain which has raised the level of the river as well as warming the water. The storm may have brought in new fish but there are also plenty of fish mixed in that were unwilling to bite just a few days prior when the water temps were significantly lower. The opposite is true in summer. Rain storms tend to decrease air and water temperatures. If the streams were too warm the reduction in temperature can improve the metabolic ability of steelhead. And as with winter, the challenge is finding the proper balance between water temperature, stream flow and visibility. The second is cloud cover, a symptom of the weather, and shade. As all steelheaders know, fishing tends to be best on those gray muggy days when there is little variation in temperature from morning to evening. Similarly, steelheaders often seek out shaded runs during sunny days, presumably because prolonged periods of high sun tend to force steelhead down to the stream bottoms where they will hold until evening and morning. 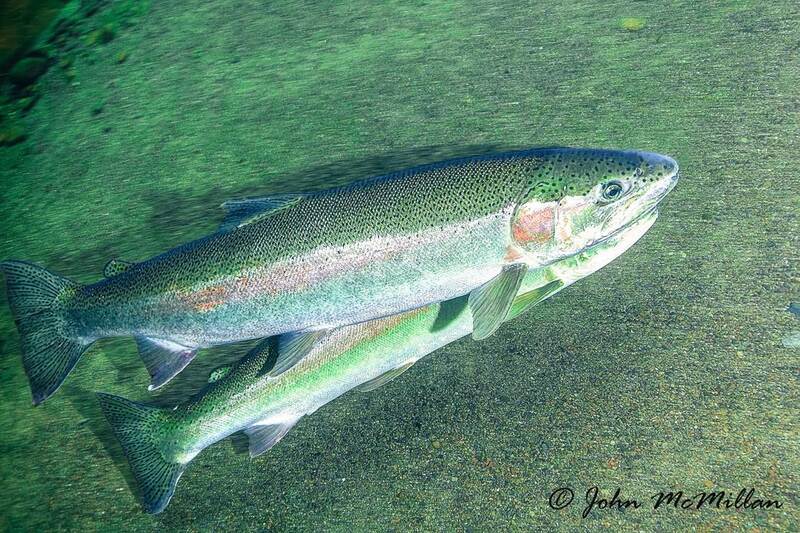 This means that being successful during the middle of hot summer days requires looking for and identifying shaded areas where steelhead feel more comfortable holding and being active. 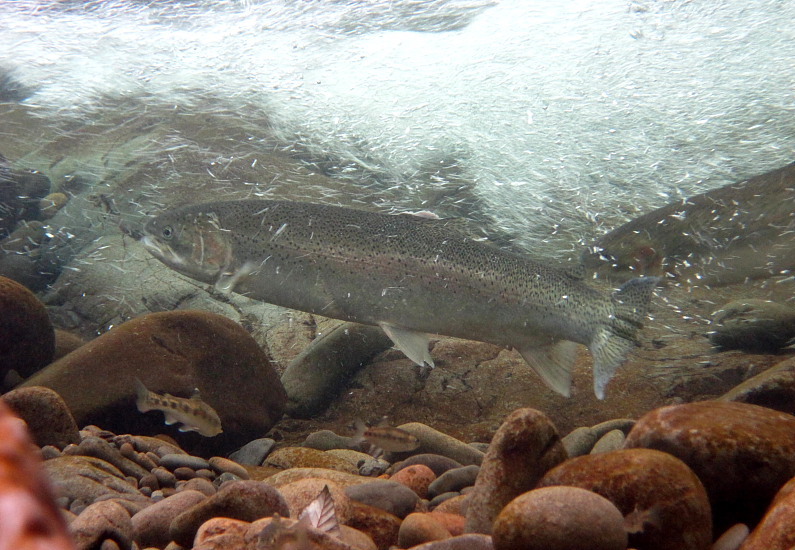 Regardless of the season, maximizing success depends not only on visibility, water temperature and weather, but also being very specific about reading the water to find those micro-habitats where steelhead are most likely to be aggressive. Third, many anglers pay attention to barometric pressure and it is commonly felt that a falling barometer is a poor time to fish while rising pressure is ideal. Fish can sense pressure using their air filled swim bladders, however water is denser than air which means that a fish moving up or down three feet in the water column will be exposed to a much greater change in pressure than from an approaching storm. Hence, migratory fish coming in from the ocean and moving up through shallow riffles and pools would experience relatively large changes in pressure, greater than we would typically expect them to notice when the atmospheric pressure changes. This means that barometric pressure is a bit of a red herring for anglers. The fish are most likely responding to other cues such as rainfall and changing temperatures rather than specific changes in barometric pressure. Lastly, and perhaps the titan of all factors influencing steelhead success is fishing pressure. Hundreds to thousands of anglers are fishing many of our best steelhead rivers in the lower-48. That means a tremendous amount of fish are hooked and landed or lost, and that fish are seeing multitudes of different flies, lures and baits over the course of a season. Pressured fish are less likely to bite regardless of conditions. Period. Whether it is a fish that has been hooked and played or simply reacting to dozens of boats going overhead, large numbers of anglers generally spook fish. This sends them in to hiding and makes them less aggressive. Why? Well we are not exactly sure of the specific causes, but it is likely related to stress. Steelhead and humans share the same stress hormone known as cortisol. Once this is released into our bodies it must be metabolized and it does not dissipate immediately once a threat is gone. On heavily pressured rivers then, steelhead could be responding to the threats with elevated cortisol levels. While this hormone helps them, and us, survive by causing cautious behavior and even hiding, it makes fishing for them that much more challenging. 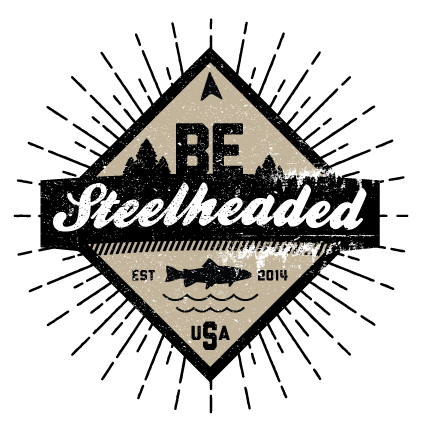 Steelheaders get up early for one main reason, to get first water so they are not fishing over stressed fish, and another reason that the internet chat boards have chastised any and all anglers to keep a zipper on it when mentioning specific places that are less fished. Ultimately, when thinking about fishing for steelhead we need to think like a steelhead and understand the reasons for their behavior. This typically boils down to considering two major factors, can a fish see your presentation and it is active enough to move and take it. As we covered here, there are many factors that play into this but they all likely depend on the basic biological needs of steelhead. Of course, there are other factors we did not discuss that can mitigate certain conditions, such as speed and depth of the presentation, color and size of the fly or lure, and what parts of the river to focus on during different types of conditions. Regardless, don’t get too caught up in all the talk, the most important thing is to get out and spend time on the water. There is no golden rule for steelheading except that being on the water and actually wetting the line is necessary to catch a fish. We have all likely caught steelhead in less than optimal conditions, but we also know that our most glorious successes tend to come when there is a magical confluence of appropriate visibility, perfect water temperatures, fewer anglers and ideal weather conditions. However some of the most memorable fishing days occur during times we did not expect the fishing to be very good at all, so most importantly, just go fishing.